Wow, what wonderful comments you all left on yesterday's post! I should not be surprised, we're a passionate group when it comes to discussing our fabric. Karen mentioned that my bins looked like fabric for sale at a quilt show, before the doors opened! For those of you wondering how I fold my fabric, I gave a demo on my March 18th post. It works great for fat quarters and fat eights. If you have a fat eight just fold your fabric in half after double folding to the selvage. I got a few more questions about what I intend to do about border fabric. This is all the border fabric I own. 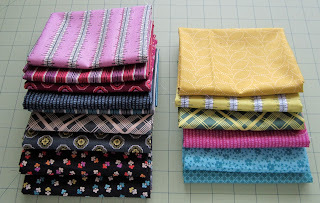 I prefer pieced borders, but if I need a border I'm guessing it will be for a quilt where I'm working with a relatively new family of fabric and I can buy fabric for the border. If it's a scrappy quilt I can probably also find border fabric that works. 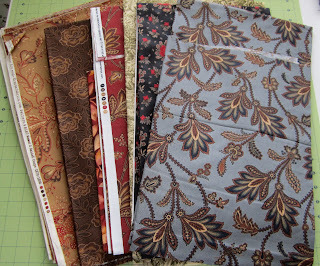 I have no plans to do anything with the border fabrics I do have, but several of them would work great with all those browns I've accumulated. Remember how I mentioned that some of the fabric I own, I own because I buy bundles? Here's a great example of that. This is Chicopee by Denyse Schmidt. 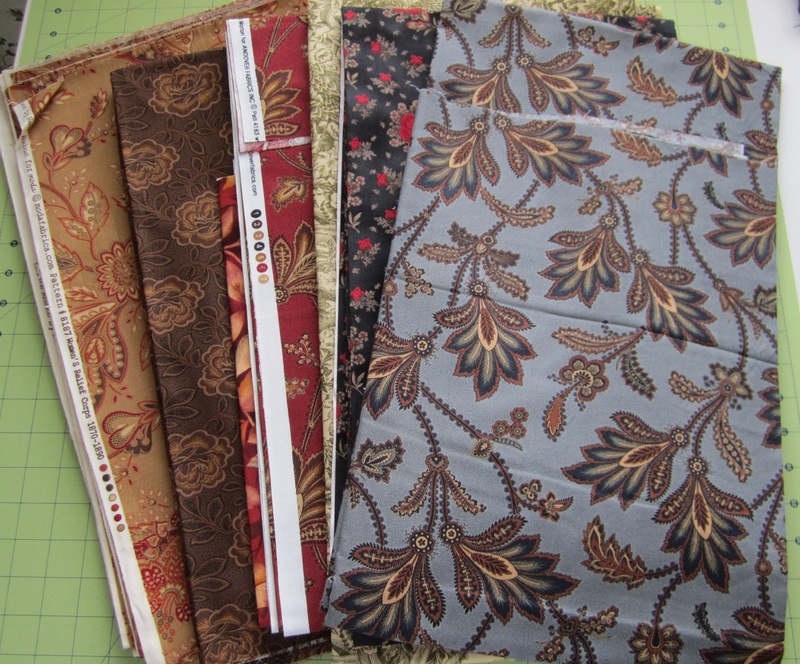 I bought the bundle because I loved the Hope Valley fabric by Denyse that I used for Bounce. I really like the lights in this bundle, the darks, not so much. Had I seen this fabric in a quilt shop I probably would have just bought the lights, as it is, the darks are going in my other bins and the lights are going into my happy bin. And speaking of happy fabric, I spent yesterday morning folding and sorting everything in that bin. How could I possibly start building a happy stash when I didn't even know what I had. Oh and about that happy fabric thing, Sinta told me she calls her fabric winter and summer. I like that, this bin is definitely my summer bin. And finally, thanks to you I've decided I'm a quilter, not a modern quilter, not a traditional quilter, just a quilter who likes everything, and that's OK. I used to have an aversion to trendy fabric or patterns, thinking the projects would be like clothes, something I liked when they were "in", but nothing that would stand the test of time. I've finished over 100 quilts, I think I can stand a few trendy enjoy it now type of quilts. Who knew organizing my fabric would be so liberating! Let the fun begin! I agree I feel as if I am just a quiltmaker. Yes I love reproduction fabrics but I am known to buy brights and make a quilt. I love looking at all quilts at the quilt show. Isn't it amazing how liberating it feels to have the fabric organized best thing I did, I think all the time it took was worth it. Love your summer fabric stah. Makes me happy to see those colors. Can't wait to see what you do with them. Just being a quilter is so liberating. You don't have to fit a particular mold.You can just be you. I'm just a quilter too - there is no rule saying we have to pick traditional or modern and stick to it. I happen to like both. I like the border fabrics you've decided to keep - especially that bottom one! I have to agree with you Thelma. I've always considered myself a traditional quilter, but the new fabrics draw me in. So why not enjoy some happy cheerful colors too!! Yes I am a quilter, who loves fabric. Can it get any easier then that?? There are so many different, fun things to learn. Why be pigeon-holed? I'm a happy quilter! 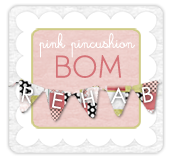 There is an awesome article on working from your stash in BHG's June 2013 American Patchwork and quilting about the "odd" fabrics in your stash. They really aren't as odd as you think and are very workable! A friend pointed this article out to me and I'm glad she did. It's a VERY GOOD article. You have a very healthy assortment of fabrics. Isn't it nice to see them all organized in your closet... or where ever you keep your bins and know that at any given moment, a quilt is ready to be made! Spring must be the time of year for reorganizing the stash! I've been spending some time refolding, reorganizing, fondling and becoming reacquainted with the fabrics I own! Now it's time to sew! I've enjoyed following along your organizing journey. Many of the things you've written about are the same ideas I had while organizing my stash this winter. I finally came to a similar conclusion about what type of quilter I am when my sister in law gave me the wonderful advice to buy and make what I like. That is when the happy fabrics started entering my stash. Thanks for all of the tips. I love all the fabrics. I too have just come to the conclusion that I am a quilter. It was getting tiring trying to label everything. I just like to quilt and make quilts that reflect the people they are meant for. 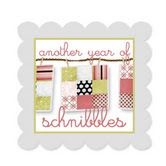 Me too...a quilter who likes everything! Once again, you are an inspiration, Thelma!! I've just moved and what better opportunity to organize my fabrics than now. So, I will trying your technique and creating bins to hold fat quarters. I am a quilter--the "modern" quilts are beginning to interest me. I'm a quilter too, not modern or traditional. I like aspects of all of them. Really I just like to work on what I think is pretty. I love the description of summer and winter fabric - I really relate to it.